Bunco theme parties are fun anytime of the year, but when it’s combined with celebrating a holiday, it’s even better. 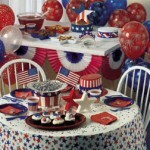 Hosting a 4th of July bunco theme party is an excellent idea that will lead to a fun fulled patriotic occasion. One thing you want to make sure your do, is have plenty of patriotic bunco theme recipes on your party theme menu. The 4th of July is a great time to barbeque, so be sure to include plenty of hamburgers, hotdogs, salad and corn on the cobb to your menu. For a fun, festive dessert, try this beautiful and delicious red, white and blue trifle. Beat together the cream cheese, sugar and vanilla extract until it is fluffy. Fold in the whipped cream until combined. You will need a 4 qt serving bowl for the trifle. Reserve 20 strawberries or raspberries and ½ cup of blueberries for later. Place 1/3 of the cream cheese mixture in the bottom of the serving dish. Try to stop yourself from licking the spoon, it will be a challenge, but you can do it. Layer with half of the berry mixture. Put another 1/3 of the cream cheese mixture in and then the rest of the berries on top of that. Put the remainder of the cream cheese mixture on top. Now you can lick the spoon, go ahead, you know you want to. Finally, use the strawberries and blueberries you put aside to make an American flag on top of the trifle and try to resist digging in until your bunco guests arrive. Once they are all there, it’s every man and woman for themselves. After indulging in the creamy goodness, you’ll need something to wash it down. This patriotic shooter is fun to look at, and even better to drink at a bunco theme party. Pour the grenadine into a shot glass. Float the peach schnapps in next and then the blue curacao. The colors will remain separate and create a flag-like appearance. Remember to grab one of these shooters for yourself, they won’t last long. 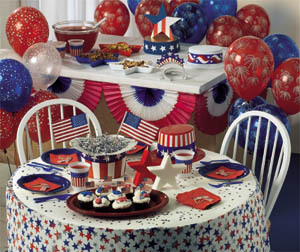 Your bunco buds will appreciate the time you took to host a Patriotic Bunco Theme Party just for them! Visit the Bunco Game Shop for other cool bunco theme ideas and all sorts of cool bunco stuff!